U.S. Mint coining presses struck more than 1 billion in cents, nickels, dimes, quarters, and half-dollars, marking a 33.4% reduction from January but 8.5% higher than in February 2017. 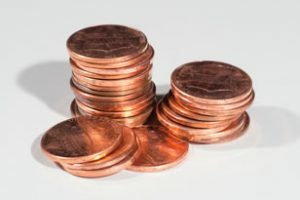 The Federal Reserve always orders more 1-cent coins than any other denomination even as it costs the U.S. Mint 1.82 cents to make and distribute each one. The bureau struck 640 million Lincoln cents in February, representing 60% of the circulating-quality coins produced for the month. 12.3% for America the Beautiful quarter dollars. U.S. Mint facilities in Denver and Philadelphia manufacture all of America’s coins for commerce. Last month, the Philadelphia Mint struck 537.59 million coins and the Denver Mint made 528.92 million coins. In the January to February period, the Denver Mint made 1,299,320,000 coins and the Philadelphia Mint struck 1,368,730,000 coins. Their combined year-to-date total rose by 2,668,050,000 coins, which is 3.8% fewer than the 2,773,700,000 coins minted during the first two months of 2017. The 2018 monthly average of more than 1.33 billion coins tracks in 12 months to just above 16 billion coins. Last year, the U.S. Mint produced over 14.8 billion coins for circulation — the third quickest for a year since 2001, after the more than 16 billion coins were made in 2017 and the over 17 billion coins were made in 2015. 208 Pictured Rocks National Lakeshore quarter for Michigan, released on Feb 5. Finalized mintages for Pictured Rocks quarter should be available by April. Having the Mint produce 640 million cents at a cost of 1.82 cents each puts a sizeable dent in the profit/loss tally to the tune of $11, 648,000 effectively going down the proverbial drain. Perhaps it’s time for taking yet another hard long look at doing away with this costly but ever more outdated, increasingly less useful denomination. Oops. My arithmetic is wrong up above for the following reason. $11,648,000 is indeed the total cost of manufacturing and otherwise processing those 640,000,000 cents; however, since the U.S. Mint does receive a face value payment of $6,400,000 for them from the Federal Reserve, the actual dollar amount that the Mint is out of pocket as a result of this transaction is in fact $5,648,000 and not the $11,648,000 as posted previously. Sorry about that. They must going too need the change for much later i* hope! Why else waste all our money for so long? Joe Brown – You of course know the old expression “penny wise and pound foolish”, right? Well, now that’s been taken a step further and someone has clearly figured out how to be “penny foolish” too! .our government should learn from Canada. Stop making penny and dollar bill . There are no point to make dollar bill if government want us to use dollar coins. We should make face value $1000 ,$5000 and $10000 gold coin. Maybe contain a microchip technology for avoid fake gold. Also it can be able who own it and where go-to . This way can avoid corruption of government and crime. From what I’ve read, a lot of them only circulate a few times before leaving the cash stream, with a fairly large number simply being lost or discarded. Hoarding is also significant but from it’s from the coins being put in jars, piggy banks, etc. due to their low value. That intentional accumulation seems to be as a painless way to get a few extra bucks by redeeming them at a bank or (foolishly) at a coin machine. The Mint experimented with aluminum cents and found them to be too light to be practical. Other countries have had similar problems. My 2¢ [/lame_joke] is that the cent’s low recovery rate would seem to indicate the denomination’s really more trouble than it’s worth. I received 3 2018-D Lincoln cents March 27 in circulation. It took that long to see them in Southern California. I visited Canada in 2015 & 2016 & they are doing just fine without pennies. We should learn from them. If WE were on the Mint’s advisory board, our suggestion would be a simple “Stop minting a coin that costs more to make than it’s worth and that nobody uses anyway”, but then, we’re not, and they won’t. Only mint the profitable proof and uncirc samples, otherwise stop the production, or mint them once every decade, nobody uses them in todays debit/credit card world. I haven’t received a dollar coin in circulation in perhaps 5 years, what a waste of money unless we stop printing paper bills. Stewart – That is a most excellent suggestion in every way, and I couldn’t agree with you more. With this kind of enlightened strategic thinking you will no doubt be able to merit the somewhat dubious honor of being as completely ignored by the Mint as the rest of us who so often engage in discussing this very situation here are.